As predicted, Oded Golan's basement (actually his storehouses) really did turn out to be rather interesting. At night, the Israel Antiquities Authority and the police searched other storehouses that Golan had not mentioned, revealing hundreds of archaeological finds suspected as being looted, boxes with earth from various locations in the country, chemicals, engraving tools, dental equipment and other suspicious items of this kind. Fugu, a pufferfish, is a delicacy in Japan, but it can be a risky meal, as it contains a deadly neurotoxin, and if not properly prepared, can prove fatal to the diner. The Fugu genome is particularly interesting to scientists because it contains very little of the so-called "junk" DNA that lies between gene segments in other vertebrate genomes, particularly the human genome. The Fugu genome is made up almost exclusively of coding sequence, i.e., DNA that codes for proteins, and of controlling regions that influence the expression of genes. Consequently, study of the Fugu genome offers investigators a potentially more direct route to the identification of genes and the analysis of gene function, by allowing them to avoid the complications of sifting through all the non-coding sequence that is generally present in the genomes of higher organisms. The Fugu genome is the smallest known vertebrate genome (350-400 million DNA base pairs), but it is believed to contain approximately the same number of genes as the much larger human genome (3,000 million DNA base pairs)—i.e., the Fugu genome is more than eight times as gene-dense as the human genome. In addition, the Fugu and the human genomes are thought to share very similar sets of genes. For these reasons, it is believed that sequence comparisons between the Fugu genome and the human genome may accelerate the identification of human genes, because genes that can be relatively quickly identified in the gene-dense Fugu genome can be used to find the corresponding genes in the much less gene-dense human genome. Looking for a gene in the human genome can be likened to looking for a needle in a haystack. Looking for the corresponding gene in the Fugu genome may allow the researchers to immediately eliminate a lot of the hay, and thus simplify and accelerate the gene search. Yahweh will send a blessing on his people. 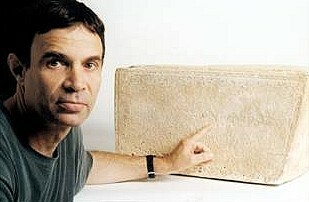 The Jehoash Inscription has been declared a forgery by numerous epigraphers and philogists but there remains the little matter of a paper published by the Geological Survey of Israel (GSI) which stated that after a thorough examination of the tablet, they thought that the inscription was very likely to be genuine. No adhesive materials or any other artificial substances were found in the patina (these were looked for just in case the forgers might have taken patina from a different stone and applied it to the inscription and the plaque). Particles of carbon were detected in the patina (perhaps a result of burning wood from a fire in which the plaque burned). A carbon-14 test was conducted on the carbon particles in the patina by a laboratory in Florida. The result: a date of about 400 to 200 B.C.E. with a 95 percent chance of accuracy. Most intriguingly, the patina also contains tiny globules of pure gold that can be formed by intense burning. It is difficult not to wonder whether the plaque was in the Temple with its gold and was burned in 586 B.C.E., when the Babylonians destroyed Jerusalem. The carbon particles in the patina may also have come from the fire, say the geologists. How smart could the forger be? Did he plant the microscopic globules of pure gold in the patina just to fool us? Did he consciously add the gold to lead us into thinking that this dark stone plaque once hung in the Temple on a white limestone wall decorated with gold, as the Bible says? Did he purposely add the carbon molecules to the mix, using some ancient burnt wood? Was he also able to fake patina in a way that would fool the geologists? How smart indeed? Yuval Goren of Tel-Aviv University thinks not that very. In his article, An Alternative Interpretation of the Stone Tablet with Ancient Hebrew Inscription Attributed to Jehoash, King of Judah, he challenges the GSI results and then goes on to explain how a forger could go about making a tablet which passed all of the (apparently not all that onerous) tests set by the GSI. The results led the GSI team to conclude that the Jehoash inscription was authentic and that it should be considered as belonging to the assemblage of Hebrew inscriptions of the first millennium BCE (Ilani, Rosenfeld, and Dvoracheck 2003:115-116). However, as we shall see below, although the analytical results are doubtlessly precise, the conclusion reached by the GIS scientists seems to be unduly biased. The mineralogical and chemical data indicate that the patina and other materials that appear on the tablet reflect acute anomalies that raise serious doubts about the authenticity of this artifact, or at least make it highly questionable. It is obvious that had they been more familiar with common forgery techniques and perhaps less enthusiastic to publish “an intriguing story,” the GSI team may have come to entirely different conclusions. Other easily available analytical methods known from the vast literature on the topic of rock surface dating, which could better fit this particular case and supply decisive results, were overlooked. In this note, we shall survey in brief the main results of the GSI analysis and review them against the background of known forgery techniques, as well as the processes of patination and dating techniques of engraved rock surfaces. Goren first looks at the "patina" coating the rocks. A patina is a natural coating that forms on rocks and is due to the absorption or loss of various elements. The problem is that while careful examination of a patina can be extremely helpful, its mere existence is not proof of antiquity because there are ways of artificially creating one in a laboratory. Furthermore, the patina as analysed by the GSI was curiously lacking signs that it had been deposited in the soil where it was claimed to be found (i.e. the Temple Mount area of Jerusalem). In fact, he says, "the patina is unlikely to be created in the Jerusalem environment or ... in any archaeological site in the Central Hill Country and beyond". The presence of micron-sized gold globules in the patina has been used as evidence supporting the authenticity of the tablet. The argument goes that when the First Temple was burnt by the Babylonians in 586 BC, the intense heat vaporized gold inside the temple and deposited it on the walls. This explanation Goren considers to be rather far-fetched and instead thinks of it is an indication of the credulity of the GSI researchers. He notes facetiously that this theory actually disproves the Biblical account because it records that the Temple had been thoroughly plundered by the Babylonians first before being burnt. He challenges the notion that a fire could have created the globules or that the stone could have absorbed the gold from burial with sediments containing it. Instead, he thinks the most likely scenario was that it was applied by forgers with a gas burner in an effort to connect the tablet with the Temple in the minds of researchers. This was presumably done before the creation of the artificial patina. Much has been made of the dating of carbon particles found in the patina, however once again, he notes that this can also be easily faked "Given the suspicious composition of the patina and the presence of gold, one may suggest that charcoal from an Iron Age II stratum at some Israeli site has been mixed with the patina when it was created in order to make it 'datable'...In any case, the radiocarbon dating from the charcoal that was embedded in the patina cannot serve by its own as evidence for the authenticity of the inscription since it could easily be 'planted' to fool the scientists." The implication of all this is that the GSI researchers took way, way too much on face-value and that the tests they performed were not the best ones to use if they had suspected forgery. Goren proposes a series of more stringent tests and techniques which should have used, including examination of the micro-laminar structure of the patina and the use of thermoluminescence dating. However thorough testing could not have been achieved under the severe restrictions that had been placed on the GSI by the private owner of the piece. Larger samples would have needed to be taken and all work would have had to have been conducted out in the open rather than in secrecy. He concludes with a parting shot at the GSI itself. Something along the lines of: "What the hell were you guys thinking?" It is evident that by bringing the Jehoash inscription to the GSI, the antique dealer or collector who owned it intended to obtain a 'certificate of authenticity' in order to offer it to a museum for sale. Apart from the obvious ethical question as to why a governmental institute would agree to promote the financial interests of individuals who illegally possess looted antiquities, there is also the question of the responsibility of the scientist. Giving an objective, serious, well-considered, and well-substantiated 'verdict' about the authenticity of an object is not only a matter of scientific integrity, but it also becomes a matter of legal responsibility when this opinion is being used by an antiquities dealer in order to convince a museum to buy the item for millions of dollars (as in this case). It goes without saying that in such cases scientists should better resist the temptation of sensational publicity and restrict their scientific work to items that are owned by formal institutions, if not to items that were discovered only in legal, well-recorded excavations. Fancy trying your hand at knocking up a few relics for the lucrative antiquities market? You might like to check out Yuval Goren's handy DIY manual: Create your own temple relic. It's a step by step guide on how to make your own patina with gold and "datable" carbon. (note: click the left arrow to move forward through the presentation). These images were taken by my friend in Udaipur, sk. As you can see, Udaipur is just a little patch of heaven. I am sending a photograph of the view of the hills from our side of the lake at dusk. Looks very nice doesn’t it. Many a time have skilful workmen tried to contrive a wheel that should turn of itself; here is a way to make such a one, by means of an uneven number of mallets, or by quicksilver (mercury). As the wheel turned, each hammer flipped over to a new position as it moved over the top of the wheel. This mass transfer (or perhaps the impulse due to its rapid motion) was thought to give a boost which would maintain the wheel's motion and provide extra motive power for other purposes. Honnecort claimed his machine would be useful for sawing wood and raising weights. It wasn't. Honnecort's diagram isn't very clear, and we can't be certain what principle he assumed might make it work. It had seven hammers, and Honnecort insisted on an odd (uneven) number of hammers. Did he suppose that when the wheel turned there would always be one more hammer on one side of the axle than on the other? Did he suppose that each hammer gave a forward impulse when it fell? But, whether the hammers were odd or even, such a wheel comes to rest fairly soon. Honnecort's reference to mercury indicates that he was familiar with the Bhaskara device, whose design had reached Europe. This "overbalanced wheel" idea reappeared in an astounding variety of forms over the centuries. We show a better diagram from a later time. A system of pegs or stops was required to hold the hammers at a large distance from the axle after they flipped over the top and allow them to hang freely as they came around the other side. Perhaps the rationale was that the balls had more moment (of inertia) on one side due to the larger lever arms (even though the principles of torque hadn't yet been formalized at this time). Even though there are fewer balls on one side of the axle at any given position, these have larger lever arms and therefore greater torque. As a hammer swings and falls near the top of the wheel, the wheel slows during the hammer fall, then gains some speed when the hammer hits its peg. There's no net gain in speed, and there's irreversible energy loss when hammers hit pegs. If given a push, the wheel will turn jerkily for a while. If it were given a very forceful initial push, the hammers would assume radial positions and the wheel would turn much more smoothly and efficiently, but would gradually lose speed and rotational energy because of air drag and bearing friction, just as any spinning wheel would. We have mostly second-hand accounts of the understanding of the principles of this machine. However, I do not think that the folks who were fascinated with this idea were unaware of the static balance condition of the wheel. I speculate that they supposed the wheel would only work after it was manually set in motion, with the hammers giving it extra boost as they rapidly flipped across the top, perhaps (they may have thought) this was due to some "advantage" obtained from the motion of each weight flipping to a position with a larger lever arm. This flipping action is much like that of a sling which gives a person the ability to throw a rock a greater distance, or the sling siege engine catapult known as the Trebuchet. Honnecort wrote about these machines of war, describing one with an 8x12x12 foot box of sand as counterweight (which could weigh 80 tons). Some had arms 50 feet long and were capable of slinging a 300 pound stone 300 yards. This connection to slings and Trebuchets is speculation on my part, unsupported by any historical study I've seen. Even though the sling action of a Trebuchet allows a greater efficiency of energy conversion compared to the rigid-arm catapult, the machine still puts out no more energy than that of the falling weight which drives it. Modern Trebuchets (built by hobbyists) have achieved energy conversion efficiencies of greater than 65%. The overbalanced wheel idea was re-invented many times over the centuries, sometimes in fantastically elaborate variations. None have ever worked as their inventors intended. But the hope never dies. I've seen examples made by country blacksmiths and basement tinkerers. The classical mechanics necessary to analyze mechanical systems is now well known, and when one takes the trouble to do this there's no mystery at all why they don't turn forever, and no reason why they should.